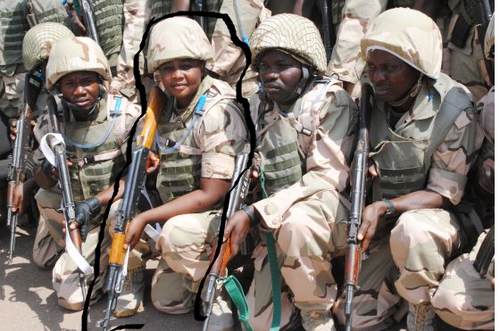 According to a report by Sahara Reporters, the Nigerian military authorities are moving female soldiers based in various army formations in Maiduguri and other parts of Borno State to Abuja as the army anticipates a massive attack on Maiduguri, the Borno State capital, by Boko Haram. The sources said there was heightened apprehension about an impending attack, hence the decision to reassign female soldiers to Nigeria’s capital. The military action also stemmed from the death of five female soldiers and the abduction of another four by Boko Haram militants when they attacked a military base in Baga a few weeks ago. Following recent intelligence indicating that Boko Haram militants were strategizing on a fierce offensive to capture Maiduguri before the February 14 elections, the army moved more than 70 female soldiers last week. One of our sources revealed that 146 more female soldiers had been moved to Maiduguri airport, where they are awaiting airlift to Abuja. The source said that all the female soldiers were supposed to have left by 10 a.m. on Thursday, but added that the military did not have a large enough aircraft to take their entire luggage. The security sources also told SaharaReporters that Maimalari Barracks, home to the 7th Division of the Nigerian Army, is the only military base left standing in Borno State. Maimalari was described as the only military formation capable of withstanding a major attack from Boko Haram militants. One source said that Nigerian military intelligence had received information that Islamist militants were regrouping in areas around Maiduguri in preparation for a major offensive against the city. The Islamist fighters’ attempt to take over the state capital last week was foiled, with Nigerian troops and civilian vigilante members collaborating to kill more than 100 terrorists. However, the militants successfully overran Monguno Barrack, killing and injuring many soldiers.